When I say the perfect day, you probably think I’m exaggerating, or that everyone says that. But I’m not kidding, you guys, this day was incredible! It looked like it was going to rain, but the skies cleared early in the morning and stayed clear until Hunter & Lyndsay ran through a tunnel of sparklers and hopped in their Uber at the end of the night. We were able to set up the venue a couple days before, so there was no stress with the setup during the day. All the girls liked their hair on the first try — how often does that happen? Like I said, perfect day. But not only that, Hunter and Lyndsay are a joy-filled, God-fearing, and just down right good looking couple! They made the day such a joy for everyone involved. Lyndsay is an incredible planner (maybe I should offer her a job?!). 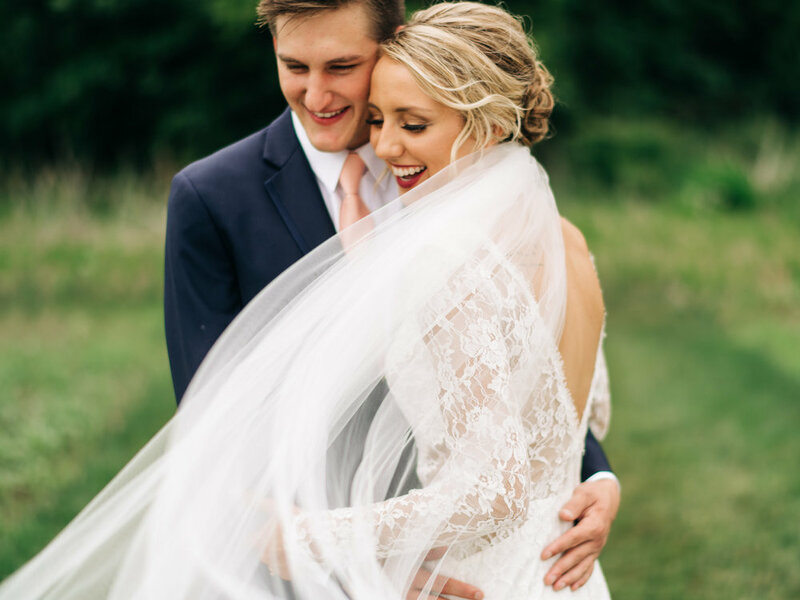 We had her wedding fully planned 3 weeks out, every decision was made! Most of my couples end up saving a few decisions for the last week (song choices, last minute decor, etc), but not Lyndsay! She thought through each detail and wanted to be sure her guests enjoyed themselves during every moment of the day. From the elaborate cheese display catered by Graze, to the hand made seating chart done by the bride’s personal attendant, to the outdoor games, guests were able to eat, drink, and party all night! Shelly Sarver created a beautiful design of greenery and florals to fill each table. Her floating candles brought warmth to the open air atmosphere of Ashton Hill Farm. One of my favorite parts about the day was seeing how loved Lyndsay & Hunter are by their friends and family. Just look at the photos of Lyndsay’s bridesmaids seeing her for the first time! Logan Clement captured these sweet and personal moments so beautifully throughout the day. See the full day below! Hire your family or leave it to the pros? Weddings are about family. It’s one of the few times you get to throw a party with your closest friends and family to celebrate your love. If you’re lucky, those people who love you will want to offer their help in whatever way they can – throwing you an awesome bridal shower, helping you with the seating chart, sometimes even tackling those DIY projects that Pinterest makes look so easy. Wedding preparation is a great time to bond with family members who want to help. But come wedding day, leave the planning and coordination to the professionals so your guests can be guests! It takes a lot of work to keep a wedding day running smoothly. Careful management of all the vendors, reading the crowd to know when it’s time to start speeches, and handling all those day-of questions that are sure to come. Wedding days always have surprises, which is why it’s so important to have someone you trust to handle any unforeseen problem so that you can enjoy your third (or fourth) glass of champagne. When you assign a family member to coordinate your day, they are no longer a guest – now they’re working! You don’t want them making decisions on what alcohol to serve when your keg is running low or trying to MC your grand march when the band forgets they are supposed to be there early for this (yes, this actually happened to me – twice!). Your wedding day will fly by faster than you think. Having a professional on your team ensures your family can be present during the day and take in every little moment. Guests should enjoy themselves, and you should too! Weddings are expensive, and when you’re putting this much money into a day it’s important to hire trusted and experienced professionals to manage it. Leave it to us to execute your event flawlessly so you and your family can truly enjoy your day. Sparkler exits. They’re super fun to do and make for awesome pictures (like this one from Alyssa and Justin’s big day! ), but you only have a few seconds to get that perfect shot. The best photos happen when all your guests are lined up and ready to go at the same time, but often times these photos come out with too few people or half of the sparklers burnt out. This post will help you ensure this doesn’t happen to you! So here are my tips for capturing the perfect sparkler exit. Using regular sparklers that you see on the 4th of July makes sparkler exits a little more difficult -- they only last about 30 seconds. It can be extremely difficult to get all 200 of your guests a lit sparkler, line them up, and get you through them for a photo all in 30 seconds. I recommend using the 20 inch sparklers from Wedding Sparklers Outlet. These have a burn time of 2 minutes and give you enough time to prepare for the perfect photo. People need direction, especially when you’re giving them fire. Have your DJ or band leader make an announcement so that your guests know where and when you want them. The key to a sparkler exit is coordinating all your guests and getting them to work together. This can be hard to do, especially since the sparklers usually happen at the end of the night after guests have had a couple drinks. If you have a wedding planner, they can get guests lined up and make sure things happen smoothly. Fire and alcohol don’t always go well together, so have someone you trust to be in control of it! I always have at least 3 lighters being used for sparkler exits. My team and I stand at the beginning, middle, and end of the line. Light one guest’s sparkler and have them pass it down. This makes getting everyone’s sparklers lit much faster. Don’t forget the bucket of water! For a lot of venues, this is required if you want to do a sparkler exit. Make sure you check with the city on what their rules are. It's more than just choosing the right napkin color. July 25, 2017 by Amanda Burrell in The "Why"
We wanted a name that represented our beliefs. My job is to create an amazing event. Your job is to create an amazing marriage. Bringing city life to Iowa. They're more important than you think. Timeline. Tide to-go. Ushers. You won't realize you need them until it's too late.